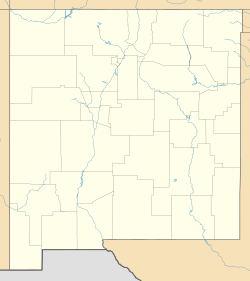 Bent is a census-designated place in Otero County, New Mexico, United States. Its population was 119 as of the 2010 census. Bent has a post office with ZIP code 88314. U.S. Route 70 passes through the community. A post office called Bent has been in operation since 1906. The community has the name of George Bent, a businessperson in the local mining industry. ^ "Bent". Geographic Names Information System. United States Geological Survey. ^ "Postmaster Finder - Post Offices by ZIP Code". United States Postal Service. Retrieved August 8, 2013. ^ "Otero County". Jim Forte Postal History. Archived from the original on 4 March 2016. Retrieved 31 October 2015. ^ Moyer, Armond; Moyer, Winifred (1958). The origins of unusual place-names. Keystone Pub. Associates. p. 12. This page was last edited on 14 January 2018, at 20:58 (UTC).